What Is The Bad Effect of Smoking To Running? →What Is The Bad Effect of Smoking To Running? As a runner, you have the best health interests in mind and probably have a few fitness goals that you want to accomplish. It may come as a surprise, but there are some runners who actually smoke while they run. If you are a smoking runner, the question is what is the relationship between smoking and running? Does smoking affect your running negatively? We’ll answer these question in this article. As a runner, having healthy lungs is very important. The better the flow of oxygen, the healthier your muscles will be to work. Muscles require a lot of oxygen in order to make energy. Smoking causes the airways to constrict which in turn limits the amount of oxygen your body gets. When your muscles don’t get enough oxygen, they cannot perform well. Because of this, your body absorbs lowered amounts of oxygen and you have lowered endurance. When we breathe, oxygen is carried to the heart which in turn distributes it to the body. Oxygen is vital for the body’s cells to function properly. The blood absorbs the oxygen and releases the carbon dioxide and is exhaled. When you smoke, you inhale mainly carbon monoxide along with thousands of other chemicals. Such high amounts of carbon monoxide poison the red blood cells which prevent them from carrying oxygen to the rest of the body. By forcing carbon monoxide into your blood, creating extremely low levels of oxygen in your blood. Since your body still needs oxygen to function, your heart works harder to distribute the little oxygen it has. This lack of oxygen results in shortness of breath. If you are a runner, such shortness of breath can lead to reduced endurance. In connection with the lowered oxygen levels in your blood, smoking can lower your endurance levels. When you exercise, your body requires up to 20% more oxygen to keep up with the strain. Smoking can cause up to a 10% decrease in oxygen levels in the blood which makes it impossible for your body to keep up with your oxygen needs. A study was conducted to determine the effects of smoking on the levels of endurance performance in teenagers proved the negative effect of smoking. It was found that there was a reduced performance level which suggested that smokers gained fewer benefits from training than non-smokers. Smoking reduces the amount of oxygen available drastically which means you will have lower endurance. Smoking has additional negative effects that are not so obvious including lack of energy. The reason for the lowered energy levels in smokers again boils down to the lack of oxygen in the body. Since all vital organs require sufficient oxygen to function well, decreased oxygen levels reduce the functionality of the organs. For one, smoking weakens the blood vessels in the body which makes it harder for blood to circulate. Without good circulation, nutrients and oxygen are not delivered efficiently to the rest of the body. Without proper nutrients and oxygen, the body’s organs become weak. In addition, depleted oxygen result in the heart rate increasing as it works harder to circulate blood. This can lead to fatigue as well. With lowered energy levels, your workouts will be less intense and will not give you the results you desire. Smoking also makes you more prone to lung problems such as bronchitis. If you have developed this condition, you may still run as long as it is acute bronchitis and not chronic. Acute bronchitis is not worsened by running although it can cause inflammation of the airways. When running with bronchitis, always slow down whenever you start having difficulty breathing or consider lowering the intensity of your workout. Alternative workouts such as biking, swimming and yoga can also be done if your bronchitis becomes very bad. Get motivation to quit. This may include wanting to improve your performance as a runner or in consideration for your loved ones. List down as many reasons as you can think of. Plan ahead. Identify the challenges you will face and make an action plan before they happen. ​Find a support group. Select friends and family members whom you can turn to when you feel like giving up. Get rid of bad influence. Hanging around smokers will only weaken your resolve so switch to non-smoking friends instead. Keep your mind on something else. Find an engaging book, watch a movie, listen to music or do something that will keep your mind distracted. Keep your hands busy. Since you are used to having a cigarette in your hand, get something else to play with. Some prefer to use stress balls or pencils. Review the reasons you listed for quitting. Try and think about all the benefits you will gain for quitting and review them mentally. ​Remove the trigger. Likely, something around you has triggered the craving so identify it and remove yourself from the situation immediately. Celebrate your success. Each time you win the fight against a craving, reward yourself with a special treat to keep yourself motivated. Did you find this article helpful? 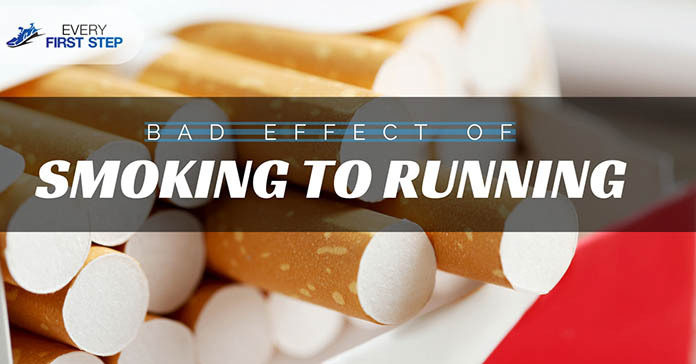 What else do you know about the effects of smoking and running? We’d love to hear your thoughts in the comments below. Please share this with other runners. How To Run With Bronchitis Without Getting Sick ?